Effective ammunition is important, but knowing how to fight with that pistol with effective ferocity is much more important. 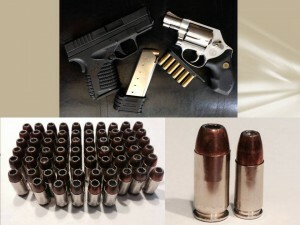 What ammunition you carry in the EDC (Every Day Carry) gun depends on the gun. I recommend a premium hollow-point like the Speer Gold Dot for 9mm thru .45acp. You want to make sure the ammunition runs reliably in your pistol. Some recommend firing 200-500 rounds of your chosen load to insure that it functions properly. Well, that’s $300-$750 worth of ammunition. Neither myself or my bank account is convinced that number of rounds is required to prove reliability. Regarding the little guns, due to their lower velocity, I recommend flat-nosed solids for the .380 and the little five shot .38s, and place your shots with extra care, think eye socket. The 148 grain full-wadcutter target loads provide sufficient penetration for the .38 Special with a 2 inch barrel. It will cut a .35 caliber hole 11-14 inches deep and that is all I would ask of it.eft with a solid. This being true, I still want to punch the largest “permanent wound channel” that I can so I carry a .45, or two. All else being equal, the .45 will always punch a larger PWC. Yes, I do sacrifice a few rounds but I am okay with that. I carry a Springfield Armory XDS in .45 acp with six rounds in the gun and another seven round magazine in my pocket for a total of eleven rounds. If things tense up I will go to a full-size .45 and carry a rifle in the Durango. Always carry extra ammunition. A spare magazine on the belt or in the pocket, and a Bianchi Speed Strip for the little .38s is a fine thing to have. If you don’t like the magazine just laying in the bottom of your pocket you might consider a thin leather magazine pouch. Retire that carry ammo about every six months. Don’t just blow it off at the range. It’s probably still just fine, just replace it with new ammunition and put the old on the back of the shelf. Repeat: Effective ammunition is important, but knowing how to fight with that pistol with effective ferocity is much more important.